The idea of unexpectedly getting in the lane to Mexico may not be a concern if this is your actual destination. However, you do want to be ready for border crossing as you enter and exit the country. Whether you travel for several months in Mexico or just for a few days, it is crucial that you secure Mexican insurance for Canadians prior to your entry. You can buy your Mexican auto insurance for Canadians online so that you don’t have to try to find a location near the border. Online selection of your Mexican car insurance for Canadians also makes it easy to compare policy options and features. Mexican insurance for Canadians is now required in order to drive on any highway in Mexico. While tourists often cross into Mexico without much difficulty, it is important to pay attention to the signals as you prepare to cross. A red light indicates that you need to pull to the side where customs officials may inspect the contents of your vehicle or ask questions. This can also be done voluntarily if you have anything to declare. Just beyond the border crossing, you may obtain a tourist visa, important if you will be staying in the country for more than three days or if you will be traveling beyond the border area. While you might not be asked about your Mexican insurance for Canadians during any such stops, you should be aware that this could change in the future. Mexico has recently enacted legislation that requires all motorists, not just foreigners, to have appropriate coverage. In order to enforce this, you might expect officials at various junctures to ask questions about your Mexican auto insurance for Canadians. 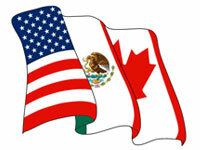 As you drive back at the end of your holiday, it is equally important to have valid Mexican insurance for Canadians. Even a lapse of one day can be a disaster if you have an accident and are not covered by Mexican car insurance for Canadians. You will face some questioning at the crossing, and you will need to be prepared to show your passport and to describe the contents of your vehicle. Careful driving is important if you are in an aggressive border crossing area, especially in heavy tourist areas like Tijuana. My whole family loves to go out and have fun and we visit often. Half of our fear is gone because I got Mexican car insurance. At least I have peace of mind while driving! I’ve been hearing troubles about buying Mexico insurance at the border. With that, I just bought my insurance through online, and it was very easy. Buying car insurance for Mexico at the border is a major hassle, you have to wait in line for terrible coverage. MexicanInsuranceStore.com is legit.